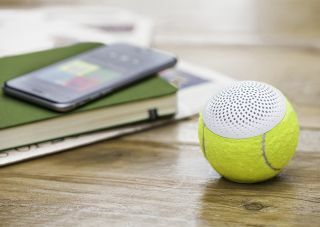 The hear0 is a wireless speaker inside a tennis ball | What Hi-Fi? The hear0 upcycles used balls from tennis championships and turns them into Bluetooth speakers. New balls please! Ever wondered what happened to the used tennis balls at the end of a major championships? No, we hadn't either, but Richard Moss evidently did when he created the hear0, a Bluetooth speaker made out of retired tennis balls. According to its Kickstarter page, the hear0 “represents a change in attitude and vision”, and it claims that tennis balls have “untapped potential” as hi-fi equipment. It’s certainly an environmentally conscious way of producing a wireless speaker. It’s both portable and durable, with a button at the bottom serving as an on/off switch, as well as allowing it to pair with other devices. It comes with a cradle that doubles as a charging device. Battery life is quoted as five hours at 70 per cent volume. The speaker grille has been designed in a Fibonacci spiral that Moss claims “optimises sound projection”. While it is still in the early stages of its Kickstarter rollout, with £6065 of £40,000 pledged, there are 22 days left until it ends on 28th July. You can visit here to find out more and pledge money. The cheapest donation is £50 (£45 for the early bird package), but for £150 you will get a hear0 signed by 1987 Wimbledon Champion Pat Cash. Ace!